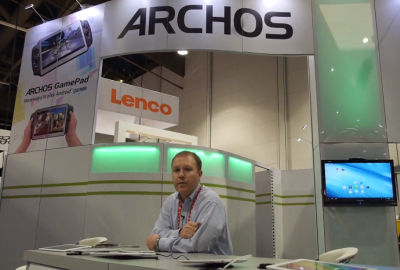 CES 2013 trade show held these last days in Las Vegas was a good year for ARCHOS in term of new product releases. We’ve seen the American launch of the ARCHOS GamePad that is selling in Europe since December 2012, a brand new product with the TV Connect and a whole bunch of Chinese models with the FamilyPad 2 device and the Titanium and Platinum lines of tablets. 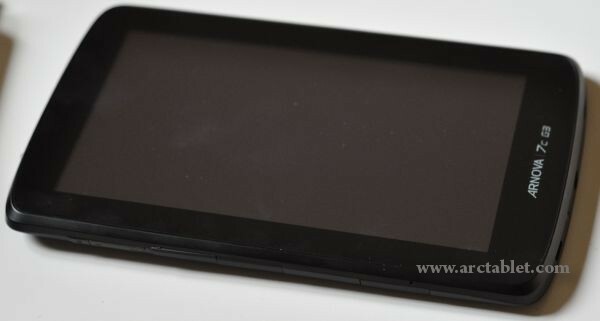 Tablets from the Titanium product line share the same specifications as they all run Android 4.1 Jelly Bean, are Google certified, they feature a Rockchip RK3066 Soc running at 1.6 GHz, Quad-core MALI 400 GPU, 1 GB of RAM, 8 GB of Flash storage, all come with IPS screens of various sizes and apparently have a aluminium back body. Titanium tablets should be available in March worldwide. 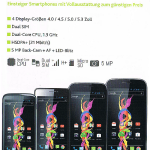 ARCHOS Titanium video by ARCHOS salesman video blogger, Charbax. The cheaper ARCHOS Titanium 7″ model should be available at 119€ / $119 / £99, it seems to use a front part of the case similar to the existing Arnova 7c G3 now paint in black (thanks yousef8824). 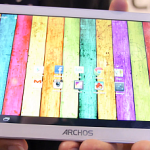 A bigger ARCHOS Titanium 8″ model will be available at 169€ / $169 / £149. The ARCHOS Titanium 10.1″ model at 199€ / $199 / £169, a bit more expensive than similar models like the very well established Cube U30GT-H. Finally, an ARCHOS Titanium 9.7″ model offering a 2048×1536 high definition screen, no HDMI output, it should soon be selling at 249€ / $249 / £199. We already mentioned in an earlier article a mitigated user experience with a similar model (CUBE U9GT5) where the RK3066 processor seems to have hard times driving the high resolution screen. The new TV Connect, turning an HDTV in an Android SmartTV. We got a some new informations on the specs: the HD camera resolution is a 2 Mpixels and TV Touch remote controller works thru Bluetooth. 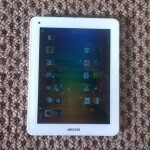 This product line currently holds 2 models, an 8 inches tablet and a 9.7 inches. It can be seen as an upgrade of the Titanium tablets, as the Platinum models come with a faster processor with a Boxchip Allwinner A31 SoC (quad-core ARM Cortex A7) and 2 GB of RAM. Finally, a product refresh of the ARNOVA FamilyPad was also shown, the old Allwinner processor got upgraded with a Rockchip RK3066. We have a new game for you called “Who made it ?” We believe that most of the Titanium and Platinum tablets are built by other manufacturers and are just rebadged by ARCHOS. Let’s try to find which is the original manufacturer of each ARCHOS Elements tablet, everyone can contribute, just post your suggestion in the comments section below or in our forum. Apart from the ARCHOS TV Connect which really shows how ARCHOS keeps innovating, the other models do not bring particular interest. Sales arguments comparing these products with Amazon Kindle, Google Nexus 7 & 10, or Ipad mini / Ipad 4 do not look very appropriate, these are different devices, with different specifications and different applications. For the Titanium line, RK3066 tablets are now about half a year old, they definitely do not provide the best performance for the price anymore. Finally, the problem with trade shows is it’s hard to see the true face of the products, product demonstrations and journalists on the show does only seem interested in sliding homescreen or starting a web browser, which do not express a lot of the tablet speed and usability. Before buying one of those, be sure to check the device by yourself or read a real review.